The worst part of Tony’s bad cold is what it did to my Cuban food fest. Oh, sure, I have been coddling and catering to him. But he still is in no mood to travel, and the closest Cuban restaurant is 45 minutes away from our campground in Okeechobee, Fla.
That’s what compelled me to make Cuban sandwiches Sunday for just the second or third time in my life. I had to have one, preferably a clone of the fabulous Cuban I got earlier in the week at Vicky Bakery near Miami. It was the only bright spot in a god-awful, traffic-snarled 10-hour drive to Key Largo and back that Tony insisting on taking. Most Cuban sandwiches are pressed and contain roast pork, ham and melted cheese, but from there the details get hazy. Variations abound. Vicky’s Cuban had the requisite mustard and dill pickle chips, but it had two kinds of cheese and the filling seemed slightly creamy, as if it had been kissed by mayo. The Cuban bakery, of course, also made the Cuban bread that was the backbone of the sandwich. I started my quest for the perfect Cuban with a 3-pound pork roast, a bottle of mojo criollo marinade and a jar of sliced olives. The olives were left from last week’s fling with Cuban picadillo and I thought, what the heck, I’ll dump them in the slow cooker with the pork roast and criollo sauce. Wow. The olives tanged up the already-tangy sour orange-garlic criollo to liftoff proportions. The resulting pork roast was spectacular, with practically no work on my part. If you want to make authentic Cuban roast pork from scratch, as I did last February, you can find the recipe by clicking on February 2017 in the Archived newsletters to the right, and scroll for the February 16 newsletter. But if you don’t feel like cooking or have minuscule kitchen space, as I do in my camper, you won’t be disappointed with the olive slow-cooker version. Criollo sauce can be found in the ethnic food aisle of many supermarkets, or visit a Latin market. I bought Cuban bread for my sandwich at a local supermarket, but I won’t be that lucky when I get back to Ohio. I have made Cuban bread in the past, but a good substitute for those who don’t want to turn a sandwich into a project would be any non-sliced, soft artisan-type loaf — not, for example, a French baguette or ciabatta. The loaf should be long, fairly low, and about 4 inches wide. Except for the roast pork, the meats and cheeses for the sandwich should be bought at a full-service deli counter. Ask that they be sliced one-eighth-inch thick. The cooked pork roast should be sliced slightly thicker at home. It is easier to slice if it is made a day in advance and chilled. Tony thought my Cuban sandwich was better than Vicky’s. He has a bad cold, of course, but even I thought the sandwich tasted like an authentic Cuban. I will make it often when we return to the vast Cuban wasteland of Ohio. Make the pork a day in advance if possible and chill. Trim fat and cut into slices between 1/8 and 1/4 inch thick. Set aside. Cut the loaf (loaves) of bread into two 12-inch-long pieces, or long enough to fit into your largest skillet. Cut each piece in half horizontally. Spread each bottom half with mustard and top evenly with Jack cheese. The cheese should cover the bread in one layer. Top with enough pork roast to just cover the bread. Top with ham, then Colby cheese, then a layer of dill pickle chips. Spread one teaspoon of mayonnaise on the cut surface of each top piece of bread. Place on top of the fillings to form two sandwiches. 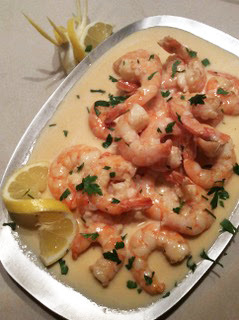 Melt 1 tablespoon butter in a large skillet over medium heat. Place one of the sandwiches in the skillet and weight down with another, slightly smaller skillet filled with canned goods. The idea is to press the sandwich. Cook until the bottom starts to brown and the bottom piece of cheese starts to melt. Remove sandwich from skillet and melt another tablespoon of butter. Return sandwich to skillet, flipped over, and weight as before. Cook until golden brown. Remove from skillet and slice cater-corner into two large triangles. Repeat with remaining sandwich. Serve immediately. • 1 pork shoulder roast, about 3 lbs. Spread onion slices in the bottom of a slow cooker. Place pork roast on the onion slices. Pour the mojo criollo marinade around the roast. Dump the olives (with juice) over the roast. Cover and cook on high power for about 6 hours or until tender but not falling apart, turning roast twice. Grilled chicken breast, cottage cheese and fruit from Pogey’s Restaurant in Okeechobee, Fla.; Cuban sandwich, empanada from Vicky Bakery in Miami, Fla.; cheeseburger from McDonald’s; egg McMuffin from McDonald’s; Vietnamese egg roll, grilled pork banh mi from Saigon Restaurant in Okeechobee; a cake doughnut from Dunkin’ Donuts. Criollo mojo-marinated Cuban pork with olives in the slow cooker; Cuban sandwiches; shrimp with garlic-lemon butter sauce and cilantro. Tony: Why aren’t there any coconuts? Me: Because those are cabbage palms. A lot of recipes call for bay leaves, which don’t seem to do much flavoring. For brothy soups, I’ve had luck by breaking up the leaves and putting them in a screen tea ball and hanging it in the pot, which I’m not inclined to do with pasta sauce, etc. I was thinking of buying a bay laurel this spring and wonder if there is a difference when using fresh bay leaf instead of dried. Also, I remember you moved your rosemary plant indoors to your unheated porch with lots of windows. How did that work out? Mine always die within a couple of months of moving them indoors, whether in direct or indirect sunlight. My rosemary always died indoors, too, which is why I started wintering the bushes in our mud room. The first year, the rosemary survived the winter. The second winter, when temperatures dropped below zero and stayed there for a while, the bush died. I gave up for a few years and just replanted rosemary every summer. I’m trying to over-winter my third bush this year. For years I, too, spurned bay leaves. The aroma and flavor of dried leaves seemed so faint that I left them out of many recipes. Then I tasted a blanc mange flavored only with fresh bay leaves. The flavor was haunting. Later, a friend gave me a few leaves from her live plant and I used them in various dishes as they dried. Since then, I have exchanged old for new dried leaves regularly and use them when called for, trusting that they provide an undercurrent of flavor. Each winter I vow to hunt down a live bay bush in the spring, but haven’t so far. If you find one, let me know. Like rosemary, it must be brought inside for the winter. 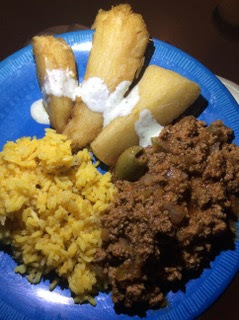 I will surely try your picadillo (from last week’s newsletter); but when I checked over your photo of the plate (of food), I could see the picadillo, the rice and what was the other yellow food? There is a man in Port Clinton who sets up a food truck in the summer at 480 SE Catawba Road and sells Cuban sandwiches. He used to have a small restaurant in Marblehead which I miss greatly. He would whip up great vegetarian options for us. Oh, and if you’re nice to him, he’ll sing a bit of Elvis for you. He is also an Elvis impersonator. How can you lose with a one-two hit like that? Elvis and Cuban sandwiches?! I’m in love. My marriage to Tony has thrived when my others have failed in part because we’re both willing to compromise. Last week he drove 45 minutes so I could see the movie “The Post” and afterward endured rush-hour traffic for carryout from a Cuban restaurant. A few days later I accompanied Tony to yet another flea market and kept my mouth shut when he carted home his fifteenth pair of hedge clippers, garish red rope lights to adorn the camper, and an 8-inch-high incense burner that looks like Stonehenge if Stonehenge were carved into naked women. Ah, well, the Cuban food was good and “The Post” was spectacular. I even got misty-eyed when I saw the Post newsroom, which looked like every newsroom I’ve ever worked in. Editors and reporters shouted and cursed. Just about everyone smoked. A sense of urgency prevailed. We fought the good fight every day for our readers. People ask me if I miss my career as a newspaper reporter. I miss about 12 years of it, not the last half when nobody swore, nobody smoked and the sense of urgency was tempered by middle-management editors who cared more about their careers than a good story. Ah, the good old days when a woman could enjoy the occasional cigar and no one even noticed. On the plus side, food has changed for the better in the last two decades. The variety of fresh food available in stores has increased exponentially, and even small burgs are likely to have a restaurant or two that produce meals made from scratch with a bit of flair. The one culinary failing of the area where I live is that no Cuban restaurants have opened yet. I have to cook the food myself or visit Florida, where I gorge on Cuban sandwiches, succulent marinated pork and fabulous Cuban bread until I’m sated. Last year I even bought, froze and brought home two Cuban sandwiches to eat later in the Ohio wasteland. This winter I’m camping in the interior of Florida miles from a Cuban restaurant, I was aghast to discover. Enter Tony, the husband of my dreams, who doesn’t mind driving 45 minutes for dinner at my choice of restaurant. This week at El Cubanito in Port St. Lucie I got picadillo, the best use of ground beef since meatloaf. The dish is simply ground beef sautéed with chopped olives and spices and served in a heap by itself or over rice. I like to eat it separately from the rice so the flavors remain concentrated. Picadillo is so easy to cook that I made it later in the cramped kitchen of our camper. When I get home I think I’ll make a big batch and use some in a favorite dish of Tony’s, shepherd’s pie. Now, that’s a win/win compromise. Sauté onion and green pepper in olive oil in a large frying pan until the onion is softened. Add the garlic and ground beef and mash the vegetables into the meat, sautéeing until the beef is no longer pink. Add the tomatoes, cumin, cinnamon and oregano. Reduce heat to low, cover and simmer for about 15 minutes. Add olives and raisins and simmer 5 minutes longer. Season with salt and pepper. Serve hot beside or over rice. Grilled skirt steak with fig-balsamic vinegar, grilled hot peppers in olive oil, baked potatoes; scrambled eggs with country bacon and fried peppers; picadillo. No-sugar Dilly Bar from Dairy Queen; a Cuban sandwich from a gas station near Lake Placid, Fla.; a bento box of California roll, octopus tempura and chicken teriyaki over rice at Hokkaido Restaurant in Port St. Lucie; over-easy eggs, bacon, grits and toast at Gladys’ Restaurant in Okeechobee; picadillo, yellow rice and yuca fries with garlic sauce from El Cubanito’s in Port St. Lucie; oysters Rockefeller, a fried grouper finger and Tortuga Shrimp — large shrimp in a creamy garlic-lemon sauce — at The Cottage in Ft. Myers; smoky, juicy pulled pork and black-eyed peas from Honest John’s Log Cabin Bar-B-Que in La Belle, Fla; and a McDonald’s Happy Meal. Again. 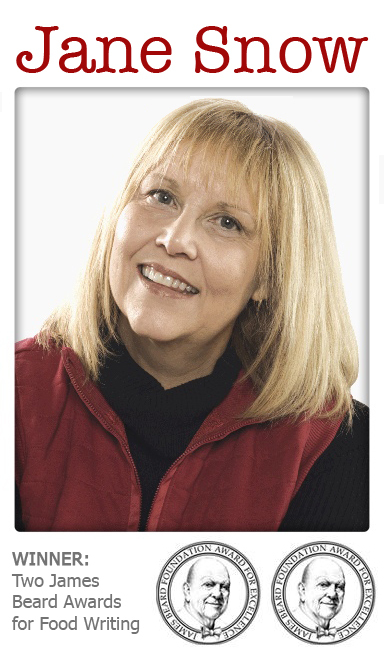 I’ve been enjoying your newsletters for years — always interesting posts and recipes. However, last week’s was disappointing — “Don’t hate”? If you’re going camping in Florida and enjoying the warm weather, good for you! I used to live in Tampa and appreciated the “snow birds” visiting from the cold, dark North. But your readers, especially those like me who live in Northeast Ohio, have been suffering with brutal, cold weather. We don’t need snarky posts about you enjoying the warm weather. I almost unsubscribed but your recipes brought back memories of my childhood in Tampa. Have some empathy. I reread that post and I apologize. I remember just two years ago when my mood nose-dived in November and didn’t lighten up until the chives came up. Sometimes my attempts at humor bomb. This was one of them. Temperatures dipped here to the low 60s last weekend, so hearty cooking was on my mind. I know I won’t get much sympathy from friends back in Ohio, where half-inch-thick ice encased cars, porch steps and anyone foolish enough to stand still for long. In Okeechobee, Fla., where Tony and I are camping, the cold snap meant wearing my Fiona the hippo sweatshirt in the mornings and foregoing the swimming pool for a couple of days. Tough life. I warmed up our camper one day with a seasoned roast bubbling in the slow cooker. Later I shredded the meat and layered it in a casserole with cheese, black olives, green onions and salsa. I baked the casserole — actually, I had enough for two — and scooped the gooey, meaty mixture into warm flour tortillas. Making the filling this way and having diners scoop and roll their own tortillas is an easy way to make burritos for a crowd. I baked one pan of filling and froze one for later, but you could assemble the casserole in an oblong cake pan for one big batch of burritos if you are feeding a crowd. Sorry to write and run, but I gotta go — the pool is calling. Don’t hate. For the beef, up to two days in advance: Place roast in a baking pan and rub all over with the cayenne, cumin, salt and pepper. Add enough water to come halfway up sides of roast. Cover tightly with foil. Bake in a preheated, 350-degree oven for about 3 hours, or until very tender. Remove foil and cool slightly, then shred meat with two forks. Season well with salt and pepper. Cover and refrigerate for up to 2 days. For the casserole: Spread 1/2 can of refried beans in the bottoms of two 9-inch-square baking pans. Top evenly with the feta cheese. Spread a half-cup chopped onion in each pan, then the black olives. Divide meat between the two pans. Top each with 1 cup of the salsa and 1 cup of the shredded cheese. Cover tightly with a double layer of foil. Casseroles may be cooked immediately, refrigerated for up to two days, or frozen. If not frozen, bake uncovered at 400 degrees for 40 minutes or until heated through. Or freeze one or both for up to 6 months. Bake frozen casserole at 400 degrees for 45 minutes, then uncover and bake 30 minutes longer or until hot all the way through. To serve, scoop spoonfuls of the casserole into warm flour tortillas. Pass hot sauce at the table if desired. Each casserole makes 6 burritos. 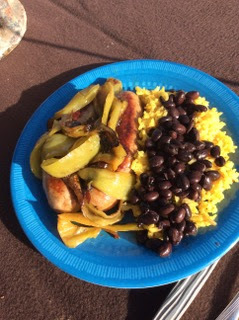 Yellow rice with Cuban black beans, sausages and fried local peppers. Marinated, roasted and shredded Cuban pork, yellow rice and black beans, fried ripe plantains and yuca fries with garlic dipping sauce at El Cubanito in Port St. Lucie, Fla.; two hamburger Happy Meals with fries on two trips to McDonald’s; a great chicken and sautéed onion taco with cilantro at a food truck in Indiantown, Fla.; a breaded pork cutlet sandwich at Pogey’s Family Restaurant in Okeechobee, Fla.; liver and onions, mashed potatoes and gravy at Lakeside Family Restaurant in Okeechobee; a sausage-egg burrito and coffee at McDonald’s. Note: McDonald’s is the only place near my campground where I can access wifi. Hence the breakfasts and Happy Meals. I did get a really cool pair of cartoon cat glasses with one Happy Meal, which made it all worthwhile. Regarding your search for Cuban food, I’ve always heard people rave about red beans and rice, but I’ve never had any. It sounds simple to make, but what makes Cuban red beans and rice so good? Are they different from New Orleans’ recipe? The seasonings are entirely different. In addition, New Orleans red beans and rice is spicy hot; the Cuban version is not. I like them both. My real fave, though, is Cuban black beans. They are long-cooked, deeply flavored, and dumped over white rice at the table. Wash and sort beans. Cover with water by 2 inches and soak overnight. Or bring to a boil, remove from heat and let stand 2 hours. Drain beans. In a skillet, fry onion, green pepper and garlic in olive oil until tender. Add to beans along with the 1 1/2 quarts water, salt, bacon, ham bone, oregano and bay leaves. Cook over low heat until beans are tender and of a thick consistency, about 2 to 3 hours. Add vinegar a few minutes before serving. Serve over rice, topped with raw chopped onion. Regarding popovers, when I lived in Great Britain I think I saw them add meat drippings to the muffin tin (at least a half inch), then heated the tin and then added the dough Maybe that’s why they didn’t stick. I’ve also seen Yorkshire pudding made in a large cast iron skillet; it looks like a Dutch baby when it’s done. Just some thoughts. Thanks for all your good info and recipes. I’m getting the idea that the more fat, the better. My popovers released from the pan after I let them cool for about 5 minutes, but they still required a bit of prying. Maybe Anne K., below, has the answer. I really have to disagree with most of what you wrote about popovers. I have been making them for 50 years. I would suggest watching the Barefoot Contessa’s popover video. She has it exactly right. Popovers fall out of the pans if properly greased. I am far from an expert popover maker, and am glad for any help I can get. I watched the video you mentioned (others should Google “barefoot contessa popovers youtube”), and Ina Garten’s recipe and method are similar to the one I tried — and failed with — the first time. There are some differences. She says to heat the muffin or popover tin for exactly two minutes, and to bake the popovers at 425 degrees for exactly 30 minutes. She stirs the batter until smooth, unlike the stir-to-moisten technique I followed on my second, more successful attempt. Her popovers turned out high and fluffy. I will try Garten’s recipe the next time. Interesting fact I picked up while researching Garten’s method: Before switching careers and becoming the Barefoot Contessa, she was a nuclear policy analyst in the Nixon administration. What the heck?! I have made gorgeous, puffy soufflés, cream puffs that rise like clouds and gougere that are crisp and hollow. I thought I knew a thing or two about pastries and air when I settled on soup and popovers for lunch with friends. What a letdown when my popovers stubbornly refused to rise. We ate them anyway, although they were dense and eggy, and we had to pry them from the pan with knives and spoons. Ugh. I couldn’t let popovers defeat me. In the coming days I read everything I could about the pastries, which are supposed to rise high above the pan until they’re crunchy outside and mostly hollow inside. I had thought beating the batter well was the key. In fact, my recipe said to beat the batter until smooth. Not true. Popover batter should be treated like muffin or scone batter, and stirred gently just until the dry ingredients are moistened. Otherwise, it will not rise. I picked up many other tips, too, such as warming the milk and heating the pan to encourage the rise. I also learned that popovers are not just muffin-shaped cream puffs, which was kind of what I imagined. They are the American cousins of British Yorkshire pudding, and are eggy and denser than cream puffs, and only partially hollow. • Warm the milk and have eggs at room temperature. • Heat the muffin tin before adding the batter. • Do not beat in flour until smooth. Stir it gently, just enough to moisten the flour but leaving some lumps. • The popovers will stick to the pan no matter how well you grease it. Have patience. After they cool about five minutes, they are easier to remove from the pan. Popovers are good warm or at room temperatures, plain or with butter or jam. Tony and I ate them with soup for supper and the next morning with marmalade and tea. Place a 12-cup muffin tin in the oven while preheating to 450 degrees. Beat eggs in a medium-size bowl, preferably one with a handle and spout. Warm milk in a microwave to about 100 degrees, not to a boil. Slowly whisk milk into eggs, beating well. Combine flour and salt and add to egg mixture. With a spoon, stir just enough to moisten flour. Do not over mix. A few lumps are OK. Remove muffin tin from oven and brush liberally with oil. Fill cups two-thirds full of batter. Bake at 450 degrees for 12 minutes. Without opening oven door, reduce heat to 350 and continue baking for 15 to 20 minutes, or until batter is puffed and beginning to brown. 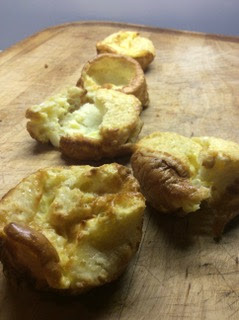 Cool five minutes in pan before releasing the edges with a sharp knife and removing popovers. Eat plain, with butter or with jam. Makes 12. Room-temperature or warm eggs are called for in many recipes — often because egg whites whip to a greater volume when warmed. If you forget to remove eggs from the refrigerator in time to warm them to room temperature, just submerge the whole eggs in warm tap water until the shells feel warm. This will probably sound stupidly self-evident to some people, but others may have struggled for years until they learned this. Count me among the latter. Pan-grilled strip steaks, baked sweet potatoes. Hamburger station hamburger with onions, mustard and pickle, a few fries; half of a roast beef, baby Swiss and onion on ciabatta bread, cup of clam chowder from Shisler’s Cheese House in Copley; wedding soup, salad and garlic bread at Marie’s in Wadsworth; chicken pot pie, a couple of bites of fried green tomato, bacon and Jack cheese sandwich at Tamarack: The Best of West Virginia near Beckley, W.Va.; pulled pork sandwich and coleslaw at Sonny’s Barbecue in Brunswick, Ga.; Egg McMuffin and coffee at McDonald’s in Ft. Pierce, Fla.; conch chowder, a conch fritter and shrimp tostones — plantains smashed and fried, topped with Jack cheese, shrimp, chopped red onion, tomato, cilantro, avocado and a spicy white sauce — at Conchy Joe’s Seafood in Jensen Beach, Fla.
No mail this week. Hey, I’m sending YOU mail from Florida. Poke your heads out of the blankets and snowsuits and drop me a line. I’m off in search of Cuban food today. I’ll report back next week. When my husband gets homesick for Japan he has a nice, long conversation with his family in Hokkaido and then he starts cooking. With the temperature in the teens last weekend and a holiday in the offing, he made one of Japan’s iconic cold-weather celebration meals, shabu-shabu. Tony tells me about eating the communal hot-pot meal around a kotatsu — a table with heavy blankets to cover laps, with a heater under the table. Diners are served platters of thin sliced meats and chunks of vegetables, which they cook at the table in seasoned dashi — dried bonito flake broth spiked with soy sauce. The food is removed from the bubbling broth with chopsticks and dunked in sauce. Tony likes sesame and ginger sauces, although ponzu sauce is also used. The meal is healthful and delicious, and designed for entertaining. Although hot pot/shabu-shabu restaurants are popping up in the United States now, it is so easy and economical to make at home that there’s no reason to spend big bucks dining out. 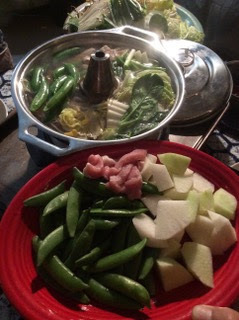 Tony and I cooked our meals in a shabu-shabu nabe — a Japanese hot pot pan — that he bought in Japan. The stainless steel, lidded pan is about 9 inches in diameter with a center chimney for heating over an electric or gas hot plate. You can buy a nabe on Amazon for about $45, but there’s no need. Google the item, then choose one of your lidded pans that is close to that shape. The center chimney helps the broth heat faster, but it is not essential. You will have to visit an Asian store to buy some of the items, such as dashi granules, for shabu-shabu. While you’re there, check out the produce, which often costs less than at supermarkets. Although the vegetables in shabu-shabu may be varied according to taste, do try to find a daikon radish to cube and add to the pot. It becomes sweet, soft and almost translucent when cooked. Make dashi according to package directions and stir in soy sauce. Make dipping sauces. Clean and cut vegetables and arrange on platters. Pour enough of the hot dashi into a a hot pot pan or other shallow, lidded pan to come halfway up sides. Place on a heat source in the middle of the table and add a few pieces of the meat and each vegetable. Replace lid and simmer until food is cooked. Diners remove food with chopsticks and dip in sauces to eat, replenishing meat and vegetables in the broth as they are consumed. The daikon will take the longest to cook. It should be very tender when done. Combine ingredients in a small pan and bring to a simmer. Remove from heat and cool to room temperature. Lentil soup with ham; Parmesan popovers; pork chops, mashed potatoes and sauerkraut. Turkey, mashed potatoes and gravy, roast cubed sweet potatoes and dried cranberries at Earth Fare; Hot Nashville Chicken with coleslaw at KFC in Wadsworth (way too sweet; won’t try it again); single hamburger with grilled onions, pickle and mustard at Five Guys. I think since Brad P. and his wife are retired (see last week’s Mailbag), he and his wife should start a foodie group through you. Did you forget I’m retired, too? This newsletter is enough work for me, thanks. But Meetup is a good place to start a group, as several writers pointed out. When you dry-brine, which I plan to try soon, can seasonings be added to the salt? Yes, feel free to add any dry flavoring ingredients, from herbs and spices to grated citrus peel, to the salt rub.